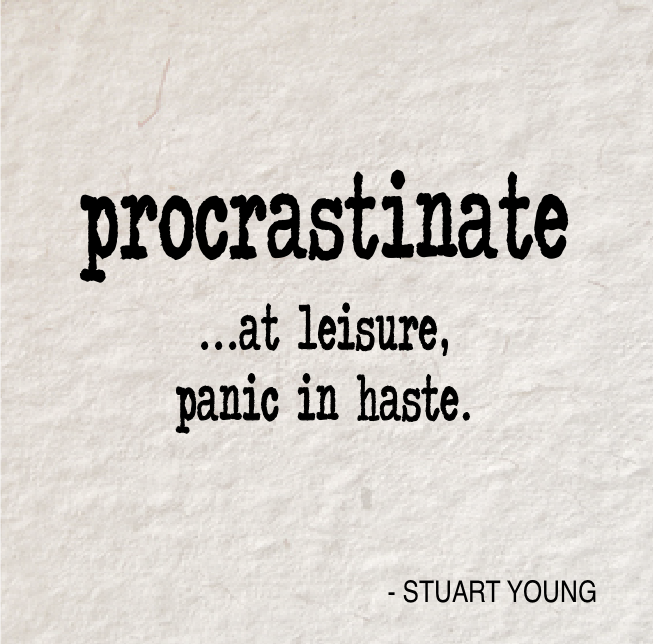 One of my Ponders group does a daily blog and linked to a fascinating article on procrastinators a while back. PS: If you’d like to receive my no cost daily thought provoking “Ponders, Quotes and Questions” emails simply email me at: stuart@HowToChangeYourLifeOneDayAtATime.com and I’ll add you right on. In Chip and Dan Heath’s brilliant book “Switch“, they talk about the necessity for businesses to adopt a growth mindset and that failure is part of that mindset. “In the business world, we implicitly reject the growth mindset. Bussiness people think in terms of two stages: You plan, and then you execute. There’s no ‘learning stage’ or ‘practice stage’ in the middle. From the business perspective, practice looks like poor execution. Results are the thing: We don’t care how ya do it, just get it done!” – They say, explaining that everything in the middle can look like a failure. 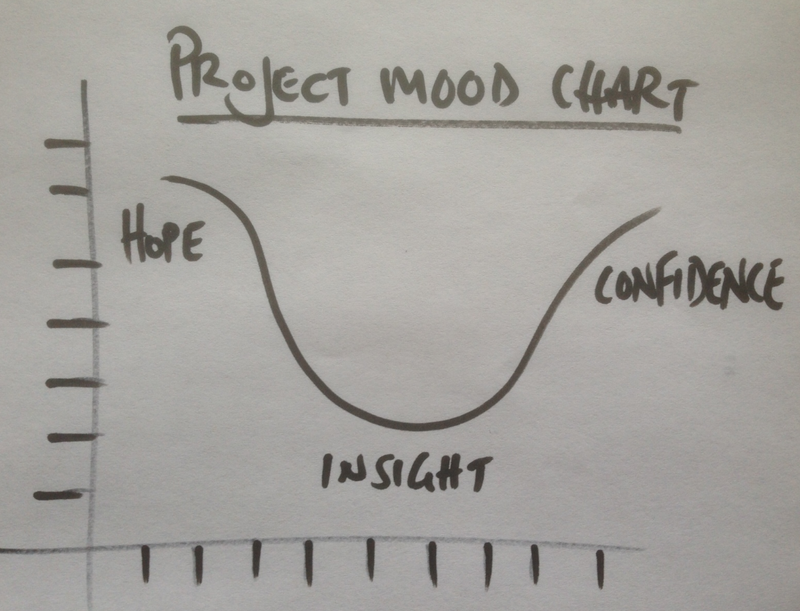 They go on to describe a ‘project mood chart‘ that plots how and why changes in emotion within a team happen at different stages in a project. Usually it starts with hope and enthusiasm, ideas are flowing freely and abundantly, but in order to integrate all of these ideas some moments of insight are required. And insight doesn’t always happen when you want it to. Depression can set in and the project starts to feel like a failure. But with persistence, improvements are made, the necessary tweaking happens and eventually the solution becomes more and more visible. They state that by telling a team to ‘expect‘ this process it doesn’t come across as negative but rather as optimistic, as now – failure is described as just a part of the overall journey to a successful outcome. Falling down as you travel down the path is an opportunity to learn where the pot-holes are, they are not a signal that you are failing to walk down the path. This doesn’t only apply to businesses, but rather to ALL aspects of life. We have to dig deep to get through the depressing down times when we’re in need of insight, but trust that if we just keep going it will reveal itself. If you’re in business at any level read Switch asap. JULY 23rd of ‘How To Change Your Life One Day At A Time‘. This is a great thought exercise as long as you let your imagination be as wild as possible. No holds barred, think BIG! By allowing your conscious mind to explore the possiblities (and what you think are impossiblities), you allow your subconscious mind to offer up ideas too. This is important as it’s your subconscious mind that holds a lot of the information you might need to actually take action on any of your ideas. If your spouse or significant other or maybe a trusted friend want to join in over a glass of wine, then it can become a lot of fun. Set some rules that keep all options open and possible, keep all comments positive – this should be fun, that’s the best way to make it creative. PS: If you enjoyed this post Buy yourself, OR someone else, a copy of my book right here on Amazon: http://amzn.to/1ahfW7R (you’ll see my listing right at the top – it’s the cheapest place to get copies at the moment and YES they’re brand new AND signed).